If your e-mail account that you want to use on your iPad is with a provider other than iCloud, Gmail (Google), Yahoo!, AOL, Microsoft Hotmail, or MobileMe, you have a bit more work ahead of you. You need a bunch of information about your e-mail account that you may not know or have handy. Starting at the Home screen, tap Settings→Mail, Contacts, Calendars→Add Account→Other. With any luck, that’s all you’ll have to do. The iPad will look up and hopefully be able to retrieve your account credentials. If not, continue with Step 4. 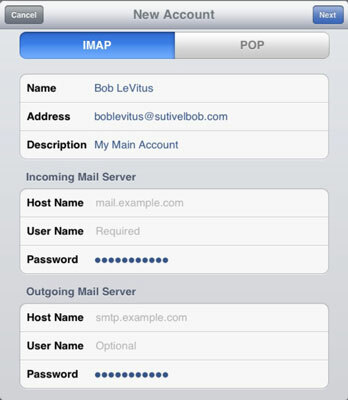 Tap the button at the top of the screen that denotes the type of e-mail server this account uses: IMAP or POP, as shown. Fill in the Internet hostname for your incoming mail server, which looks something like mail.providername.com. Enter the Internet hostname for your outgoing mail server, which looks something like smtp.providername.com.